Alice Knowles was born in Boston, Massachusetts into an Irish Catholic family. She is the third child of five – one of four daughters. Faith and church were central to their lives. Alice participated in many church-sponsored activities – Girl Scouts, Legion of Mary, and Catholic Youth Organization (CYO). She pursued education and career goals that were inspired by her focus on social justice, charity, and community. Alice received her Bachelor’s degree in Sociology from the University of Massachusetts – Boston and completed a Master’s degree in Community Mental Health from Northern Illinois University. Her professional life has been dedicated to public health issues. Alice has worked in community residences for deinstitutionalized adults, nursing homes, community mental health systems, state public health agencies, philanthropic organizations, hospital systems, and research organizations. She is currently a data analyst for a healthcare system in Cambridge, Massachusetts which has been a safetynet hospital and is continuing to serve underserved and marginalized populations of the nearby communities. Sixteen years ago Alice was introduced to Dignity/Boston. It was there that she met KathyAnn. In 2004, they were married at a liturgy with their faith community, families, friends and coworkers. Alice has been active in the Dignity/Boston chapter. 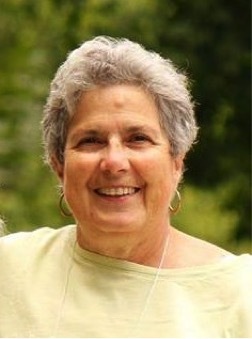 She is completing her 6th year as a member of the DignityUSA board where she works with the Women of Dignity. REGISTER HERE to receive dial-in number and then a short piece by Alice. Email the words “Register Me Alice Knowles” to Cathy at waterstaff@hers.com.